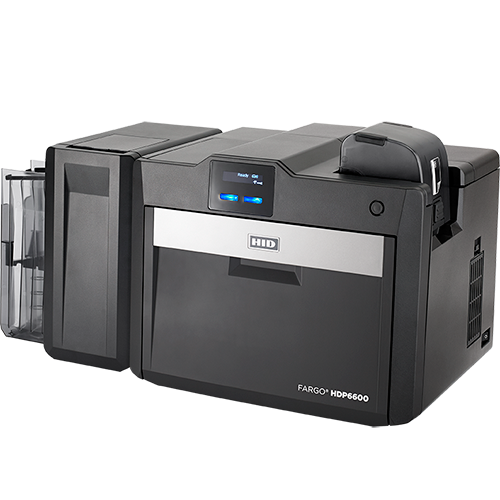 The Fargo HDP6600 Card Printer produces IDs and cards at unprecedented speeds. Leveraging HID Global’s innovative wasteless lamination technology, the HDP6600 is designed to meet the needs of cost- and efficiency-conscious organizations by cutting high-volume lamination materials cost by up to 40 percent. Featuring HID Global’s patent-pending iON™ technology, the HDP6600 card printer reaches optimal operating temperature in under 60 seconds, expediting the retransfer printing and lamination processes. It has been GreenCircle® Certified as significantly reducing energy consumption over comparable card printing and lamination systems, due to the built-in intelligent temperature control. The ability to print up to 230 cards per hour (YMCK w/ transfer). A patent-pending iON™ technology for intelligent temperature control and unparalleled printer readiness. Able to simultaneous print and retransfer. The HDP6600 Card Printer is built on six generations of proven retransfer technology and offers the versatility to meet your card application needs today and in the future. For one-step, inline printing and encoding, HID Global offers multiple, field-upgradable encoder options as well. Fast, innovative, feature-rich and reliable, the HID FARGO HDP6600 Card Printer sets the new customer demanded standard in retransfer printing.